Due to low ticket sales, tonight’s Bloc Party (Monday 29th January) has been cancelled. 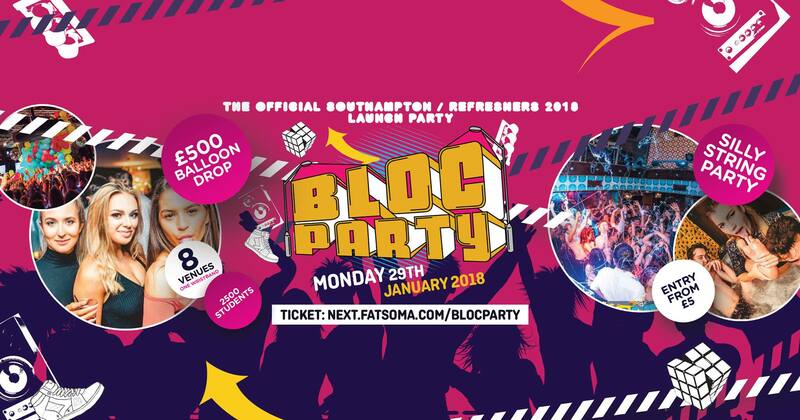 Originally advertised as part of Semester 2’s Refreshers’ schedule, Southampton Bloc Party was due to happen tonight in Bedford Place, offering entry to Orange Rooms, Popworld and Tokyo, amongst others. The night, which traditionally attracts around 2,500 students, was advertised as including a £500 balloon drop, 1,000 free chicken nuggets and hot tubs. Tickets were priced at £5 for a super early bird ticket, £6 for an early bird, and £7 for a standard. Whilst tickets purchased through Fatsoma will be refunded within 5 days, we have reached out for clarification on how customers of a Refreshers’ Pass will be refunded. SUSU has been contacted for a statement.